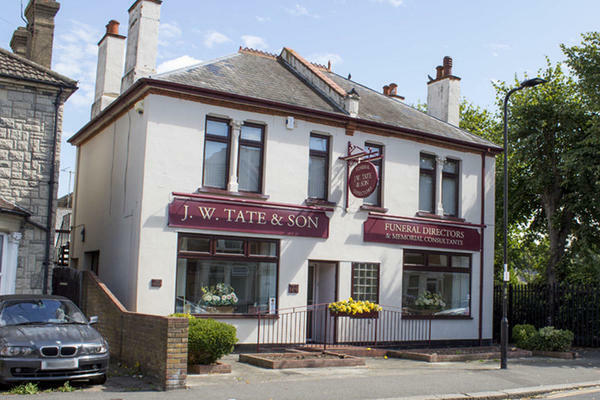 J W Tate & Son was established in 1898 by the Tate family. We have been serving families local to Southend for over 100 years. In the beginning we were builders, and many of the homes surrounding us in North Street were built by our founders. Our rich heritage and care for our community is embedded in our practices. Our funeral home in North Street has always been a funeral directors. We have disability access in the form of a slope to the front door, and all of our rooms are on one level to make the whole building accessible to every visitor. We want nothing more than to help you to arrange a funeral service beffiting of your loved one. If you need any help or advice we are always here for you. You can reach us by telephone 24 hours a day. Call us today on 01702 343064 to talk through your personal requirements. We are situated next to the North Road Cemetery. Our staff are available 24 hours a day on 01702 343064 if you require our services outside of these hours. changes which I did. The whole process went off without a hitch. All of the staff evolved made my son and I feel very special as if we were the only people saying goodbye to a special person. Thank You All.